Most points-to analysis research has been done on different systems by different groups, making it difficult to compare results, and to understand interactions between individual factors each group studied. Furthermore, pointsto analysis for Java has been studied much less thoroughly than for C, and the tradeoffs appear very different. We introduce Spark, a flexible framework for experimenting with points-to analyses for Java. Spark supports equality- and subset-based analyses, variations in field sensitivity, respect for declared types, variations in call graph construction, off-line simplification, and several solving algorithms. Spark is composed of building blocks on which new analyses can be based. We demonstrate Spark in a substantial study of factors affecting precision and efficiency of subset-based points-to analyses, including interactions between these factors. Our results show that Spark is not only flexible and modular, but also offers superior time/space performance when compared to other points-to analysis implementations. N. Heintze. 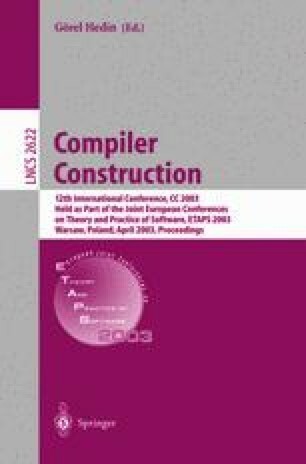 Analysis of large code bases: The compile-link-analyze model. http://cm.bell-labs.com/cm/cs/who/nch/cla.ps, 1999.